Who has not at one time or another wished that they could go back in time and change something? Who has never thought, “I wish I wouldn’t’ve said that,” or “I wish I had done that,” or “If only I could do it all over again.” I’d be willing to bet there is not a man or woman alive, or who has ever been alive, that has not at least one time wished something like that. But what would be the consequences of such an action if it was feasible? If one could go back in time and correct one mistake or change one action to alter a current predicament, what would be the ramifications? There are many schools of thought on this. One widely prevalent one, at least in the world of speculative science fiction, likens the stream of time to a slow moving river, its surface placid and smooth. Even the tiniest disturbance, such as the drop of a pebble or the landing of a fly, causes ripples across the stream that reverberate and are amplified, changing the entire complexion of the time stream, at least in its immediate vicinity, at least for a while. Of course, applying that theory, the bigger the disturbance, such as dropping a Mack truck into the time flow instead of a pebble, the bigger the disruption, both on the surface and deep below it. At the other end of the spectrum is the theory that the river of time is a shallower, relentless, fast-flowing current that blows over and obliterates anything in its path, so inexorable is it in its passage to the future. If that is the case, then the seemingly insignificant act of dropping a pebble into such a stream would have little to no effect at all on the flow of the overall time stream. Even the dropping of a Mack truck into the cascading river would not appreciably alter the course of the river. Its effect would be smoothed over and obliterated in seconds, relatively speaking, as the torrent continued its onward march, unaffected, and probably not even aware of the temporary disruption. Of course, the truth could lie anywhere along the spectrum in between the two extremes. If one believes in chaos theory or the butterfly effect, making that one single, individual change, no matter how seemingly insignificant, would result in a completely new reality or universe. In that newly created reality, the original problem that led to the desire to make changes in past events might not even exist in the future, the future that will become the present from which the agent of change left. As in the film “Back to the Future,” making changes in the past erases the present from which the changer came from. From that time on a new future or a new reality develops and proceeds from there. If you believe in chaos theory, even a minimal change, perhaps even the presence of the one who makes the change in the past where he or she was not before, would be the death of the present from which he came, no matter what. So going back in time to get out of a particular situation would not merely affect that situation, it would create a new universe in which that situation may or may not even arise in the new future. And, even if it did come about, it might manifest itself in a completely new and unintended way. Trying to fix a problem of the present by returning to the past might not only eliminate the problem or render it moot; it could very likely create an even worse situation—out of the frying pan, into the fire, if you will. It would follow that making minor changes in the past would result in only a subtly altered present and making major changes would result in a drastically altered reality. The changes in degree could grow exponentially. For example, going back in time to tell your father you loved him before he died might not change much, but going back in time to assassinate Adolf Hitler before he rose to power would completely rewrite the universe, creating an alternative present that might not even come close to resembling the original present. And, not only could it be a better future, it could be one much, much worse. Where perhaps Stalin rose to power in Russia and started an even deadlier war or another dictator even worse than Hitler rose in Germany and began to exterminate his enemies even sooner and with even more efficiency. Would anyone be willing to throw the dice on that? On a personal level, if one went back in time to do something different, that person, as he had been when he left the present at least, would cease to exist once the change was made. For example, if one went back and changed their college degree program from science to business, that would create a completely different person, and who is to know if that new person would be happier or better off than the person the changer was running from? We, as people, are a creation of our experiences. Our lives and personalities are molded by the events in our lives and the people we meet. Our total existence is the sum of all these events and encounters. If we change a single event or do not meet a certain person, we would no longer be the person we were. Certainly if we changed a large event or never met a person who had a huge impact on our life, whether, good or bad, we would become someone else. We would keep the same name and the same looks but inside we would be a different person, in our hearts and minds. If we follow the exponential degree of change based on the size of the actions taken, going back in time so as to avoid a fight with one’s wife on a particular day would not have the same personal consequences as say, going back in time and not going to work at the Twin Towers on Sept. 11, 2001. However, in either case the future would be changed to some degree and that person who went back in time would not go on to be the same person that left the present. If one went back to break a chain of events that led to an undesirable outcome, theoretically eliminating the first link in that chain, or any link for that matter, would completely undo it and none of the subsequent events in that chain would ever come about. But breaking the chain would also create a new present completely divergent from the one the time traveler left, resulting in not only an altered situation but also a new world open to new and different possibilities, good and bad. All of this due to one single change of the past. And, as was presented before, the future of that life would not be the life that the time traveler had lived before, because each change that was made, beginning with the person’s reemergence in the past, would inevitably create a new present reality. Again, the situation or problem that one went back in time to change, might not ever come about in the newly created universe of the altered present. Would that future, or present, from which the traveler fled, cease to exist or would it have never been? That is the paradox of time travel. If one subscribes to the theory of infinite universes, there would always be a universe where the traveler decided not to take the trip or make the change. But that reality would be off-limits and unattainable for the traveler once he departed the present, because simply by going back in time, he sent the course of history down a completely different path with all its new, multiple possible branches, much like the beating of butterfly wings, according to chaos theory. Therefore, one must conclude that wishing to go back in time to change something, get a do-over, or hit the reset button, is nothing more than an exercise in futility, a monumental waste of time. Even if the person’s wish came true, that person would no longer exist, or would no longer be that same exact person. 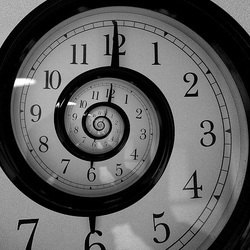 Of course it is useless to even contemplate time travel until someone finds a wormhole in space that bypasses the flow of time itself and loops back to some point in the past, if such a thing could ever exist. In the absence of time travel, I am convinced that this universe is all there is, no branching into infinite possibilities, no butterfly effect, no chaos theory. There is only one path that has led to the present. What has been, has been and, as they say, there is no going back. What will be, however, is a completely different story. Every decision you make, every action you take, affects your future in a myriad of ways. Therefore you must be careful with what you do. Just as you can’t put words back in your mouth once they have been spoken and you can’t take back the words you wrote in the email once you hit ‘send,’ you can’t reverse time and change your actions. Still, I don’t think that this completely human wish to go back in time and do something over or do something different will ever go away, no matter how futile or fruitless it may be, because it is still nice to think about sometimes.